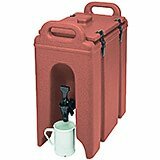 Camtainers Insulated Beverage Containers, 2.5 gallon capacity. Stackable. 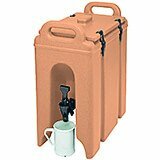 Keep beverages hot or cold for hours! Perfect for front or back-of-house use. 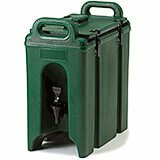 Drip-proof recessed spigot allows for easy access and can be easily adjusted without tools. 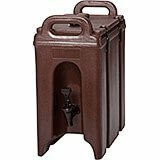 16-1/2" x 9" x 18-3/8"
9.5" X 9.5" X 16.5"
The APS Paderno World Cuisine 10 quart insulated stainless steel beverage dispenser is a staple at any buffet. 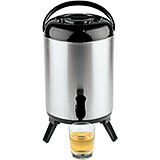 It has a flip top spout for easy dispensing and ensures an even and smooth flow. 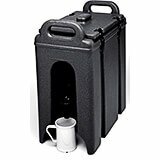 It is balanced on three sturdy black legs and has a lid with a handle for easy transportation. 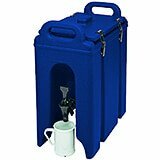 Great for coffee or tea at any event. It has a diameter of 9 1/2" and a height of 16 1/2". 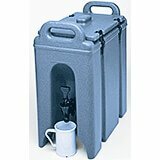 Material: Stainless Steel.Capacity: 10 Qt.